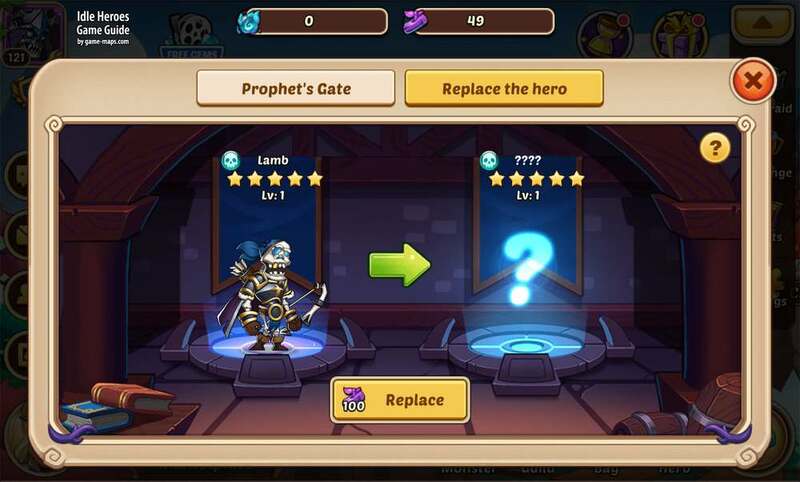 In Prophet's Replace in Prophet Tree you can use Prophet's Blessing and replace hero to another hero with same faction and same star rank. Idle Heroes Strategy Game Guide. 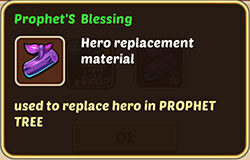 In Prophet's Replace in Prophet Tree you can use Prophet's Blessing and replace hero to another hero with same faction and same star rank. On the replacement results are not satisfied, you can cancel it to keep the original hero, but the consumed Prophet's Blessing will not be returned. Locked hero and hero in arena can't be replaced. Only can you replace 4-star hero and 5-star hero. The Light and Dark hero can't be replaced. Once the replacement is successful, the original hero will lose his level, tier, equipment, stone, artifact, and all of them are transferred to the new hero. You can check the relevant information of the result heroes in Replacement screen, but the hero attributes showed are for level 1 hero and only for your reference.